This week we have a guest on our blog, Mr. Brad Vaill, Director of Client Services who gives insight into the “Celebrity Way” of doing business. Since their inception in 1989, Lexus had quite a mountain to climb in from of them. They were poised to take on Luxury automotive giants like Mercedes and BMW in a very competitive market with customers who had deep-rooted loyalty with these brands. Many industry insiders felt that Toyota, known then for affordable, quality family automobiles, could not produce a luxury vehicle that could compete with the heavy-hitters from Germany. What Lexus did correctly, from the very beginning, was not just spend a significant amount of resources on the engineering of their first vehicle, but to focus greatly on the customer experience. 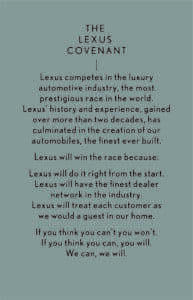 When the brand was just beginning, Dave Illingworth, Lexus’ first Division Manager, created the LEXUS COVENANT. For those associates who are first joining our brand, it is the guiding principles by which we all strive to live by. When Tom Maoli first purchased the former Warnock Lexus, he brought both an all-new enthusiasm and energy to our industry. Never having owned a dealership before, he brought along Gary Gabriele, a childhood friend who had spend the majority of his career managing hotels. The vision was simple. Why not leave the traditional “Car dealership” mentality behind, and bring along a Luxury Hotel mindset, that would match perfectly with our Luxury vehicles? By doing exactly that, the “Celebrity Way” was born. Together, we began to change the culture of our dealership, coaching our current associates and tirelessly searching and interviews new associates who wanted to be part of a whole new automotive experience. When all associates focus on the smallest of details, and the support, coaching and encouragement come from the very top of the organization, great things can and will happen. When we all first met Tom and Gary, one of their favorite expressions was always “Why not us?” Unbeknownst to us, their core business beliefs mirrored so closely with Lexus’ core beliefs one could almost say we were all destined to work together. When the covenant was written, Dave referenced “The Little Engine That Could”, one of his favorite books from childhood. This is where the closing lines of the Covenant come from. If you believe you can, never let anything get in your way. When Tom took over, we were ranked 16th in sales in the entire Eastern Area. In 4 years, we were number 1. As for me, my job is to do all I can to support our associates and do everything in my power to be certain our guests receive the most professional, courteous, efficient and friendly service and sales experience in the industry. Every day presents different challenges to face, problems to solve, and issues to overcome, but the most rewarding part of the experience is helping solve a concern for a guest of ours, and giving them the confidence of knowing that while we may never be perfect, we will always be there to help and support our guests. Over my 14 years with Lexus, some of my favorite and most loyal customers have become that way because of a problem solved or a issue addressed. Relationships with our guests are very similar to relationships in life. It’s through the difficult times when you really know who you can count on. We have a wonderful staff at Lexus, with many associates here 20 years or more. We laugh a lot together and with our guests, and do all we can to foster an environment of inclusion. So many of my regular guests know all too well about my allegiance to the New England Patriots, and the love to visit me during the season to tell me how much they hate my football team. And I wouldn’t have it any other way. 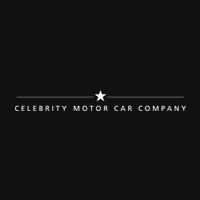 There simply isn’t a dealer that compares to us, and I would welcome the chance to spend time with anyone looking for not just a Luxury Lexus vehicle in the future, but a true “Celebrity Experience”.